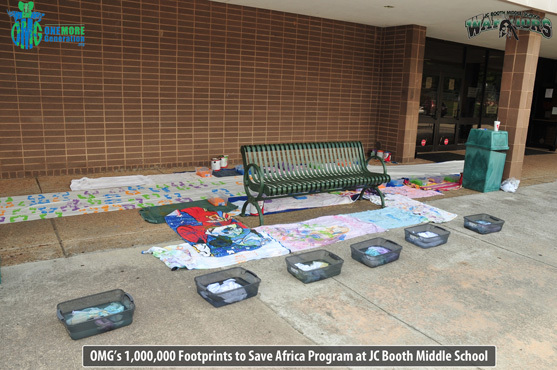 Recently our friends at Eco Sense for Living accompanied Olivia and Carter as they executed their first ever 1,000,000 Footprints to Save Africa Campaign here in the USA. 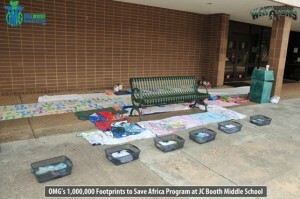 The staff and students at J.C. Booth Middle School in Peachtree City Georgia welcomed OMG with open arms and everyone got involved in helping to spread the word about what is happening in Africa to many animals and to the heritage of the African people. Eco110 OMG SEGMENT from 1moregeneration on Vimeo. The event was a huge success and is already spreading to schools across the US. If you are interested in hosting this event at your school of or community organization, please send us an email at info@onemoregeneration.org and we will gladly help you out. The supplies needed to host such an event are listed below and cost less than $1.00 per student on the average for an entire school. 4-Gallons of acrylic water based paint (1-gallon per color). Pick four bright colors but stay away from red. 8-Plastic containers with lids. These can be obtained at Walmart or a craft store. The containers need to be large enough for a full size foot to fit in. 16 large car washing sponges. One sponge will be placed in each of the 8 containers. 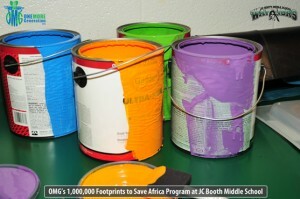 Paint will be poured in the containers to allow for the sponge to absorb the paint and the students can place their foot on the sponge. 4-6 larger plastic containers which will be filled with warm soapy water so the students can step off of the muslin/sheet and into the water to wash their feet. 30-40 regular size bath towels. These will be used to allow the students to dry their feet. Muslin. You will need about 40-60 yards of standard muslin which can be bought at most craft stores in rolls. This amount will allow for about 700 to 1,000 students to place their footprints on the sheet. The overall cost of all the materials is usually under $1.00 per students with leftover materials for additional events if needed. Once you have all the materials, we will set up a call/Skype so we can discuss any questions you might have. Our goal with this campaign is to raise awareness to the plight of African animals and it’s people on a global basis and to encourage others to get involved. We have reached out to folks at UNESCO and are discussing the possibility of having all the canvases from around the world travel as an art exhibit on a global journey that will help educate others about the need to get involved. We wish to thank the staff and students at J.C. Booth Middle School for their help and in particular, Mrs. Julie Barry for her continued support of all we do here at OMG. US Embassy in Hanoi Introducing the 1,000,000 Footprints to Save Africa Campaign from 1moregeneration on Vimeo.